RS: How was it when you got back? Did you face any problems from your Muslim community? FM: Yes, from the time I embarked on my India trip, I had to face a lot of challenges; especially from the people at the mosque. I was the vice president of the Muslim youth group and used to lead the namaz, the daily prayers at times and I also used to call the Azan (the holy call to prayer). Some of them came to know that I had started believing in Sai Baba and had gone to India to meet Him. One of the nights during the holy month of Ramadan, Laylat al-Qadr, Muslims are supposed to keep vigil and chant hymns and the Holy Quran in the mosque. On that night I had gone to the mosque. I carried a book of Sai Baba along with other scriptures. One of the management board members saw me reading the book on Baba and it upset him. They called the mosque board meeting and chastised me for praying to a man as God. They took away my vice president position and banned me from leading the prayers and calling out the Azan. The people who used to treat me as their very son now shrugged their shoulders and turned away. There was a hostile environment and I was treated like an outcaste who had converted to another religion! RS: What did this do to you? FM: I felt really hurt at all this; I did not deserve this treatment. I also understood the cause for their behaviour. I was praying to Sai Baba now as I accepted Him as my Guru. As I continued praying to Him, I realized I was becoming a better Muslim at heart. After a while I thought, “Swami, my visits to the mosque seem to agonize these people, so let me stop going.” However I had to drop and pick up my mother who was going to the mosque regularly. 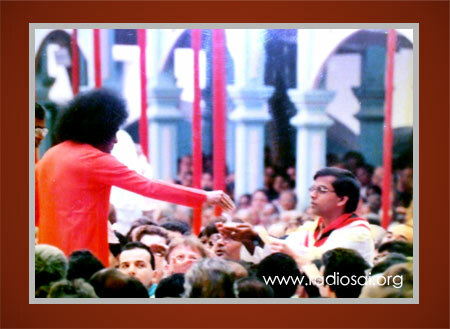 Swami works miraculously! After a year or two, my mother organised a Quranic reading session, an exercise in which you invite the members of the mosque to read and interpret the holy Quran and sing Islamic devotional songs. I requested my mother for a chance to speak after everybody had finished. Very lovingly I told them: “Whether you call Him Rama, Krishna, Allah or Jesus, it is the same God. The most important thing is not our belief in God, but how that belief overflows into our conduct and behaviour. God is going to look at the purity of our heart and intentions; our conduct is more important than what religion we follow. No religion is greater than the other as all of them belong to God and He has no favourites!” And the most amazing thing happened after that. The Imam came up and said, “Brother Fize, what a wonderful message you have given!” I was shocked! I thought, “Oh Swami, these are the same people who discarded me from the mosque.” When I enquired a little further, I came to know that some of these Muslim brothers had attended the talks I had been giving all over the country about the message and teachings of Bhagawan Baba and that His universal message had taken root in their hearts! There was an old man in the mosque who was celebrating his 70th birthday; he called me over the phone and asked me to give the fete address in the mosque! I weaved into the talk some of my favourite sayings of Bhagawan such as 'Love All, Serve All', 'Help Ever, Hurt Never', 'There is only one religion, the Religion of Love', and so on. I did not utter Swami’s name, but put His message about the universal tenets of religion. After the talk, people started asking me where I read these beautiful teachings! I told them that there is a Divine Master walking on the face of the earth. They were benefitting from the message of Swami even without knowing about Him. RS: Swami was transforming them, working in His own way. What happened after that? Did you make any more trips to India? FM: By Bhagawan’s divine grace and will, this is my 28th trip to Puttaparthi. On an average I visit Bhagawan once a year and by His grace, I was blessed with eight interviews. RS: Can you share some of the interviews with us? FM: Sure. The first interview was in 1983. Prior to that I had met with a major motor accident in June that year. June 19 is a public holiday in Trinidad. We went for bhajan on June 18 and the next day being a holiday we sang bhajans throughout the night. The next morning, as we were driving back with three other devotees, we smashed into another car coming at a very high speed in the opposite direction. The steering wheel hit me in the chest. I coughed out blood and lost consciousness. I was hospitalized and devotees who came to see me in the hospital were chanting the Gayathri Mantra. The strangest thing is that I was feeling no pain at all and was discharged in three days. I was chanting the mantra too. After I came in contact with Bhagawan, the only mantra that I would chant in meditation was the Gayathri. In October that year, 45 of us from Trinidad came to Prasanthi Nilayam and were granted an interview during which I was sitting two feet away from Swami. As soon as I sat, He said, “It was I who saved you from that accident!” I felt so grateful to Bhagawan. Here He was thousands of miles away when that accident happened to me, but this was the first thing He told me. He put His hand on me and said, “You drive too fast. Start early, drive slowly, reach safely." His hand went in the familiar clockwise circular motion and out came a pendant! I bowed my head thinking He was giving it to the gentleman behind me. He said, “It’s for you!” and dropped the silver pendant with His form on one side and Om on the back in my hand. And then when He took groups of people to the inner interview room, the other people wanted to see the pendant. As I was showing it to them, He came back, slapped my shoulder and said: “No exhibition!” I hid it away immediately. There was an elderly gentleman in the interview room who was always concerned about me. He got up when Swami came back and asked, “Swami, don’t You think we should get brother Fize married?” I was only 23 then. I got up and said, “Swami, I will marry only if you decide the person!” Swami said, “Nahin nahin nahin (no, no no), let parents decide, I will bless.” It took eight years before that person came to my life! But I was not sure that Swami had blessed this. In 1991 He was in Whitefield and I was sitting in my last darshan for the trip and was holding my prospective bride’s photo and a letter in which her name and wedding date were written. I thought if He took the letter, I’d think He has blessed the wedding, otherwise it was not to be. Darshan began and Swami came towards where I was sitting. I had the letter ready in my hand. 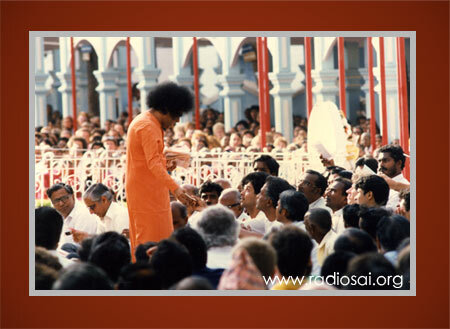 When Bhagawan was only fifteen feet away, He turned and started walking away. I folded the letter and kept in my pocket thinking that He did not approve, when suddenly He turned around, came straight to me and plucked the letter from me! I fell at His feet and cried. That is how my marriage was approved in October 1991. My wedding happened in about a month’s time on Novermber 24. I wanted to visit Prasanthi Nilayam immediately after, but I did not have enough money to come back. So I started praying and this is what Swami did. Air India had a promotion in which they randomly picked the names of people who had traveled to India during a specific time period and gifted them a trip to India. So one fine day I got a call from Air India, and they said, “Is this Mr. Fize Mohammad? Congratulations sir. You have won a trip to India!” We got married on November 24 and on the 27, we were traveling to Puttaparthi! After I returned from India I continued to share Swami’s messages. But I lacked self-confidence and that would make my whole body sweat and my heart pound every time I would give a talk. But as I would start speaking, my eyes would close and Swami’s message would come on its own without my intervention! One day I got a call from a person very close to me who was also a prominent doctor in my country. He did not like my way of speaking off the cuff and his criticism seemed very insulting. I felt very hurt.